In order to control traction we first need to detect when traction has failed. This post presents a hardware and software solution for efficiently detecting when traction is lost. One of the challenges with detecting a loss of traction is that there is a lot happening. The RCArduino test vehicle generates two interrupts for each revolution of each wheel. With the four wheels rotating as much as 80 times per second, thats 2 * 4 * 80 = 640 interrupts per second. If we add two or three RC Channels we quickly approach 1000 interrupts per second. It might sound like a lot to process, 1000 interrupts in a second, but the 16Mhz processor in your Arduino is able to get through 16,000 operations in each one thousandth of a second. More lights = Less traction. You can see the car light up on acceleration and the lights go one by one as traction is recovered. If the processor is so fast, why do we need to focus on efficiency ? The problem is that there will be times when all of our interrupts will occur at the same time. The Arduino is only able to process one interrupt at a time and so a queue will be formed. The interrupts within the queue are processed according to a fixed priority, not the time at which they occured. If each type of interrupt takes 10 microseconds to process, we could have the signals we want to send to our ESC or steering servo (TIMER1COMPA in the table above) disrupted by upto 50 microseconds which can represent as much as a 10 percent error in the throttle and steering signals. The Arduino UNO, Leonardo, Mini and Micro have only two external interrupts, so how will we read four wheel sensors and two or more RC Channels ? In the past the RCArduinoBlog has featured the pinchangeinterrupt library, this uses a capability of the ATMega chip in your Arduino to attach an interrupt to any of the 19 pins. The pinchangeint library adds higher level code to this low level capability in order to provide very similar functionality to the two external interrupts. This convenience comes at a high cost in terms of performance but fortunately there is a simple trick we can use to access more interrupts without the performance hit of the pinchangeint library. If we limit ourselves to using just one pin from each of the Arduino ports we can eliminate all of the processing overhead normally required to determine which pin has caused the interrupt. This approach provides us with a total of five highly efficient interrupts, enough for four wheel sensors and a PPM Stream containing our RC Channel information. Ok, but whats a port ? 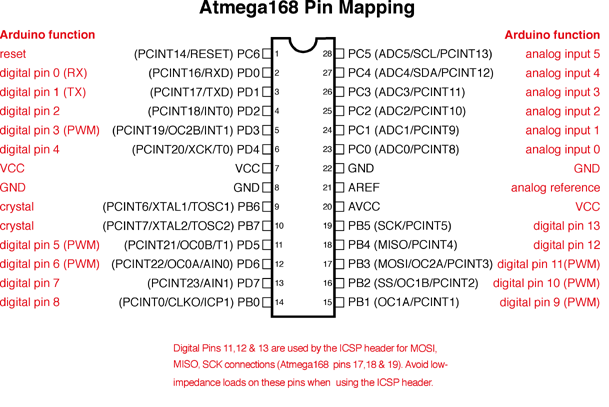 The ATMega microprocessor in your Arduino has its pins arranged into ports, the following diagram shows how the Arduino software maps digital and analogue pins onto the ATMega 328 microprocessor ports. Similar diagrams are available for the ATMega 32u4 and ATMega 2560 used in the Leonardo and Mega. The diagrams all show the pin function assigned by Arduino in red accompanied by black text which gives the ATMega port, pin number and any additional functions supported by the pin. If we look at the Arduino pin labelled digital pin 2 we can see that nearest the pin, this is also labelled PD2, this tells us that the pin is pin number 2 on PORT D.
To create a port change interrupt we must select a single pin from a port. If we try to use more than one pin on a single port we will need additional code to determine which pin has changed, this will quickly use up our performance advantage. As an example of the cost of having multiple pin change interrupts on a single port, the pinchangeint library is around 5 times less efficient than an external interrupt. If we limit ourselves to this one pin per port approach we can have three additional interrupts with no lose in performance. 2) Configuration - Registers set up and control each of the chips modules, sometimes we will need to access a module which is not set up by default. Registers can be thought of as a set of related switches which can be turned on and off to control some part of the chips behavior. Once you know the registers used by the modules your interested in, its as simple as programming the push button interface of a kitchen appliance. Lets walk through the set up we need for the pin change interrupts used in the traction control project. We have discussed that there is a major performance benefit in enabling just one pin change interrupt on each port and this is easily done through setting the corresponding but in a mask register however before we do this we should return to the pin mapping diagram and take a closer look at the secondary functions of each pin. The text between the brackets indicates the additional functions supported by each pin, for example analog input 0 has ADC0 and PCINT8 (analog to digital converter 0 and pin change interrupt 8). 2) Choose pins where we do not expect to use the secondary function later in our project - I might want to use SPI for data logging for example so must avoid these pins. Now that we have our pins, we can use the mask registers associated with each port to attach the interrupt. All of this information, including the chip modules, the registers associated with each module and the individual switches within the registers can be found in the datasheet. In this case we are dealing with PCICR and the PCMSKn registers found in sections 13.2.5 to 13.2.8 of the ATMega328 Datasheet. // by this constant error in each measurement. Hi Duane, Just h\ving a good read of your latest blog. Have you considered using a magnet and hall sensor on the outdrives to each wheel hub to detect relative rotation of each axle? May save you painting all of your wheels, and prevent damage etc as all components are inboard and mounted to gearboxes etc. I did consider using the outdrives however the two cars I have the biggest traction issues with are both two wheel drive so I do not have a full set of outdrives. I did consider adding outdrives to the non driven wheels just for this purpose but painting the wheel hubs is no hassle at all and works well enough. There are also other advantages - no need to balance additional rotating weight and you can have a lot of light/dark bands on a single hub for higher resolution wheel speed measurements. Like the setup, have been looking at a retro fit TC on Full size 4x4 using ABS valve blocks. Could I use a VR sensor + conditioner (5v output) and connect directly to the UNO? Trying to get hold of you about a potential collaboration, but can't find your e-mail anywhere - apologies! Could you provide me with an e-mail or contact me at josewareham@obanmultilingual.com? Hey, what comparators did you use? I'v gotten a sensor worked out, but the change in voltage across the sensing diode is much too low for the arduinos digital inputs. I used an LM324, it gives four opamps in a single chip. I have configured them as schmitt triggers, but this is more trouble than its worth, next time i will just use the opamps to build comparators. Hi, you have a great project here, congratulation ! how do you plan to brake the wheels ?? Have you looked at doing it analogue? I'm in the process of putting traction control on my Dagu Rover 5, using the odometer pulse from the wheels, I'm charging a capacitor through a diode (charge pump), then looking at the voltage with an analogue input. Could you provide a list of parts that I could use to simply measure the speed of a wheel on my rc car using an arduino?